Juliet of the Spirits is out on Limited Edition Dual Format on September 24th. And to celebrate we have a great competition for you and a copy to give away. 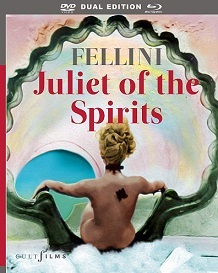 Fellini’s fantastical first ever feature-length colour film which now makes its world-wide Blu-ray debut. Hailed as one of the greatest tributes a husband has ever paid to his wife, Fellini’s real life partner Giulietta Masina (La Strada), plays her namesake and delivers a superb performance in this internationally acclaimed classic. (Yet bizarrely it also co-stars Sandra Milo known to be Fellini’s mistress). Giulietta is a bored, timid and unfulfilled wife. Suspecting her husband’s infidelity, she enters a surreal journey of self-discovery filled with wild dreams and enchanting fantasies, much of which involve her sexually liberated neighbour Suzy (Sandra Milo – 8 ½) . Fellini moves on from neo-realism and becomes ‘felliniesque’ in his first colour film emphasised by the ever-delightful whimsical music score of the OSCAR® winner Nino Rota.